A healthy lawn is very beneficial in many ways. It is good for reducing pollution, reducing temperatures, aesthetically pleasing, a surface for relaxing or playing, the list could go on and on. What do you have to do to achieve that perfect lawn? I wish it was one simple thing that you have to do. However, it is not that simple. It can actually be a complex process with differing tasks depending on the situation. 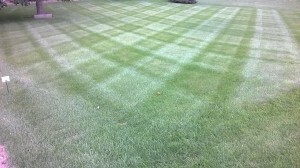 This is where you would insert a shameless plug for hiring a lawn and landscape company to do the work for you. And that is definitely a plausible option if your finances allow. At times, managing a single home lawn can be a lot of work, and at other times, it can be simple. This list is a broad idea list of what needs to be done and monitored for to help to achieve that grass that is desired. A lawn and landscape professional will be able to help you with any problem that may arise and should be able to offer the service. And the lawn and landscape professional will be able to answer any questions that you may have about any of these tasks for you lawn. Please do not hesitate to contact us with questions or quotes that you would like. Our mission at Harkes Landscape Management, LLC is to provide our residential and commercial customers with the highest quality and honest lawn, landscape and snow management services that help to improve their properties.